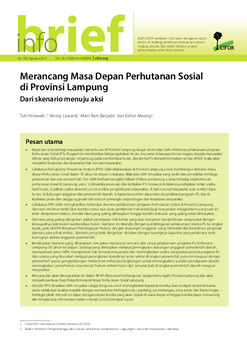 Nining Liswanti is Researcher at the Equal opportunities, Gender, Justice and Tenure (EGT) in CIFOR. 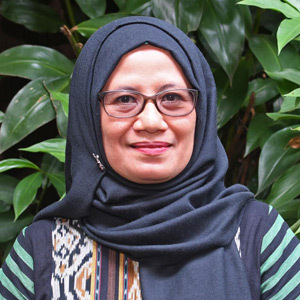 She graduated from faculty forestry at the University of Gajah Mada and completed a master\'s degree on Environment and Natural Resource Management from Bogor Agriculture Institute. 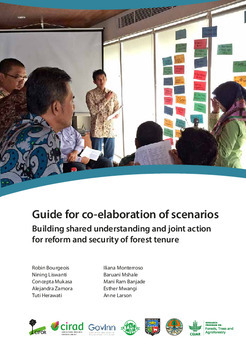 She joined CIFOR in November 1994 and have been worked on different research activities including biodiversity assessment or PFA (1994-2000), Multidisciplinary landscape assessment or MLA (2001-2010), Land use planning on CoLUPSIA project (2010-2014), GCS-Tenure Project on Securing Tenure Rights for Forest-Dependent Communities as coordinator for Indonesia and Nepal activity (2014-2018) and CIFOR/ICRAF collaborative project on Trees on Farms (TonF) on Harnessing the potential of trees on farms in realizing biodiversity goals (2018-2021). She has many field experiences in forestry sector in Indonesia including Sumatera, Kalimantan, Papua, Maluku, Lampung and Sulawesi. 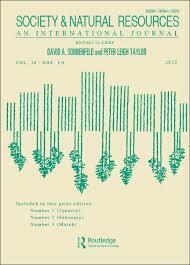 Authors: Bourgeois, R.; Liswanti, N.; Mukasa, C.; Zamora, A.; Herawati, T.; Monterroso, I.; Mshale, B.; Banjade, M.R. ; Mwangi, E.; Larson, A.M. Authors: Banjade, M.R. ; Liswanti, N.; Herawati, T.; Mwangi, E.
Authors: Liswanti, N.; Tjoa, M.; Silaya, T.
Authors: Liswanti, N.; Tjoa, M.; Silaya, T.; Banjade, M.R. 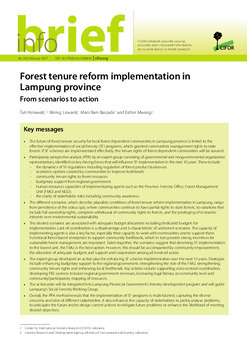 ; Mwangi, E.
Reformasi tenurial hutan di Indonesia: Kapan? Apa? Mengapa? Authors: Banjade, M.R. ; Herawati, T.; Liswanti, N.; Mwangi, E.